Rug Cleaning Farnborough - Oriental Rug Spa offer a specialist Persian, Oriental and Contemporary rug cleaning and rug repair service in Farnborough, Hampshire. If you live in Farnborough and have a dirty or soiled rug that needs professional cleaning, then why not give us a call on 01276 423150. You can drop the rug into our wash facility or arrange a time for us to collect from you. Yalameh rugs are woven in the Fars province in southern Iran. They have a distinct design with multiple diamond shaped medallions in a straight line throughout the field. The diamond devices usually have geometrically stylised designs within, comprising of animal, bird and floral patterns. 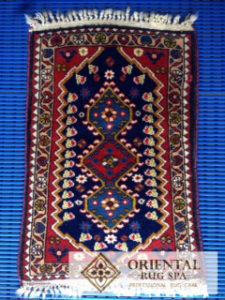 Yalameh rugs can be similar in appearance to Quashgai and Shiraz rugs which are woven in the same area. 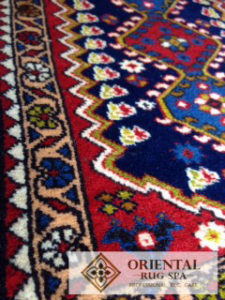 The rugs are woven on a wool or cotton foundation with a wool pile. They are constructed with a soft yarn of medium-wear using a red, blue, brown and orange colour palette. Yalameh rugs tend to be constructed to a higher standard than many tribal rugs, using a very fine pile.